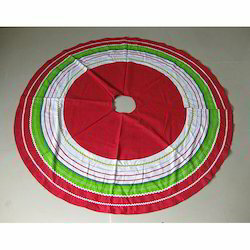 Christmas Tree Skirt offered find suitability for Christmas tree decorations. We provide a wide assortment of tree skirt to our clients. The collection offered by us is widely appreciated for their quality fabric and intricate designs. These are available in various sizes, color, shapes and styles. Our product range enhances the aesthetic look of the house. Moreover, we also customize the exclusive range of product as per the requirements of our clients. What a better way to celebrate Christmas time than the seasonal decorations of your home. Seasonal phrases, holly and stars artfully combined to create the familiar shape of a Christmas tree. Whether you need to cover up an unsightly tree stand or want to create a total picture with your Christmas tree, a CHRISTMAS TREE SKIRT can serve as a special finishing touch for your tree. We, at Collective Creation, offer a wide range of Tree Skirts made in Felts, Jacquard, Polyesters, velvet, etc., embroidered and embellished to give the perfect feel. Christmas Tree Skirt & Reco. Intricately hand embroidered with crewel stitching, our tree skirt features graphic holiday icons blown up to make a dramatically cheerful statement. Monogramming is available for an additional charge. Our organization is indulged in offering Christmas Tree Skirt to our clients. These are available in various colors, designs, shapes. These are specially designed for festive celebrations. 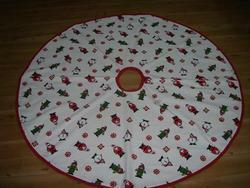 These Christmas Tree Skirts are wide used to decorate the Christmas Tree. Whether you need to cover up an unsightly tree stand or want to create a total picture with your Christmas tree, a CHRISTMAS TREE SKIRT can serve as a special finishing touch for your tree. We, at Silver Cord, offer a wide range of Tree Skirts made in Felts, Jacquard, Polyesters, Silks etc., embroidered and embellished to give the perfect feel. We are engaged in offering high quality Tree Skirts to our customer.